As previously mentioned, Too Much Hanky Pantry came with a flexi disc by the McTells and Rig Veeda and the Twins. Better late than never, here are my scans of the disc and its limited edition sleeve (limited in the sense that they weren’t ready in time for Too Much…). The artwork was by Gillian, one half of Bi-Joopiter. Some time ago Continuo also scanned these and added Rig Veeda and the Twins’ ‘Creep’ from the flexi disc to a download of the Twins and Rig Veeda’s The tale of the man with the toothpaste head LP. The LP – the Velvets (and occasionally the Cramps) meet the Swell Maps at the grass roots of experimental lo-fi – has stood the test of time rather better than the flexi. While you’re there, have a scout through the wide range of musical esoterica unearthed by Continuo – fun for all the family, though Messtheticists will feel particularly at home. As you will have divined from the cover of Too Much Hanky Pantry, the second issue of my fanzine came with a flexi disc by the McTells and Rig Veeda and the Twins. Paul McTell and his Bi-Joopiter partner in crime Gillian very nobly put up the money for the flexi, despite being not that much less impoverished than I was. It was also distributed with The Hip Priest and Escape From Bereznik fanzines and was played by John Peel, resulting in a deluge of SAEs and a trickle of demo tapes. I singularly failed to do anything with these, which is a great shame as I might well have beaten Sha-la-la to Exeter’s Visitors and subsequently gone on to found an extremely successful independent record label, rubbed shoulders with Alan and Noel at the infamous 10 Downing Street party in ’97, stuck the knife into Blair when it all went sour, and blew my ill-gotten gains on a habit which mollified the disappointment of losing out to fresher and more entrepreneurially astute labels on all the groups who might previously have wished to associate themselves with me. Rehab, gradual dwindling of activity, retirement, death. In an extremely unlikely conjunction of old and new formats and technology, one of the tracks on the flexi, ‘Virginia M.C.’ is available in video form on YouTube. The suitably sepia-toned and murky footage (from a compilation video for the housing and homelessness charity Shelter) looks like something from the dawn of cinema, but clearly audible is the electroconvulsive racket made by these pioneers of the international pop underground. 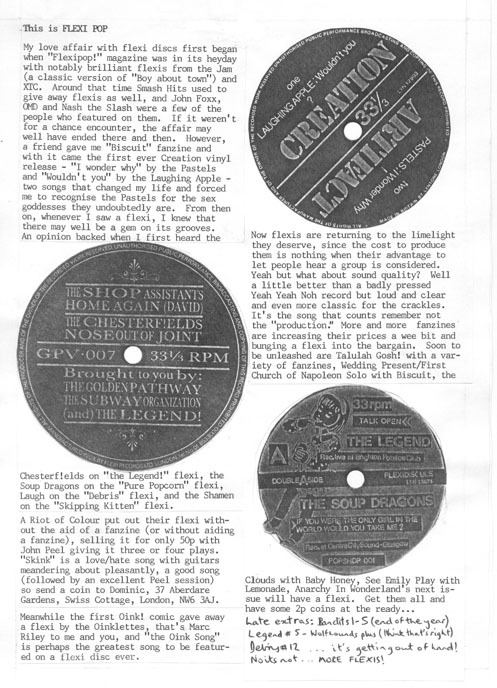 Again from Lemon Meringue Pantry, a page which as it emerges blinking into the bright light of the digital age should now become a primary source for all historians of the flexi disc. See also ‘Disposable pop: a history of the flexi disc’. You’ll have to excuse the embarrassing assertion about the Pastels. The affair didn’t last long, but I confess I did play the ‘Million tears’ 12 inch half a million times. Shame the Shamen didn’t make the flexi chart that featured on the following page. Their Wayward Wednesday in May affair dates from well before they encountered ‘Ebeneezer Goode’; both ‘Four letter girl’ and ‘Stay in Bed’ are classic examples of moody eighties psychedelia which at the time made them seem like the negative to the positive of the Jasmine Minks. Acid or mushrooms rather than ecstasy, I guess. Laugh – Take your time yeah!